1.17 Do not use sulfur on apricot trees. Deciduous tree from 3 to 10 m. high. Rounded appearance. Erect stem with a greyish-brown bark and a surface full of cracks. Reddish young branches, very twisted adult branches. Oval leaves up to 9 cm in length, nearly oval-hearted shaped, rounded with small teeth, dark green color beam and a yellowish green beneath, ending in a pointed apex. Flowers gathered in pairs or solitary, shortly stalked, white tinged with pink about 2.5 cm in diameter. It has edible fruits, called apricots, drupes that are yellow or reddish orange, with a diameter of around 3 or 4 cm and 8 cm long, although there are varieties with bigger fruits. Its flesh is yellow and it covers the stone, which as a toxic seed in its core. The well rooted apricot trees do not need to be watered unless during very dry periods; they resist moderate periods of drought. Under rough drought circumstances, they can drop their buds. The apricot trees need to be watered until they are well established. During the first year after planting it is important to water thoroughly. It is cultivated for its fruits, apricots. Apricots need a very specific climate to grow and produce fruit properly. Although it is a deciduous tree that requires a period of cold in winter (between about 300 and about 900 hours of temperatures below 7 º C, depending on the variety), being a tree that blooms very early (between the months of March and April, before the birth of the leaves) is very sensitive to late last winter or spring frosts. It prefers the warmer climates where it can be grown as a normal tree or shrub in a sunny location, sheltered from cold winds. The Mediterranean climate is ideal for this plant, it provides enough cold in winter so it can develop normally and the infrequency of frost in late winter or early spring makes this plant to keep the flower in most seasons. In the cooler climates it can be grown under cover or grow through “fan art”, which means attaching the plant to a wall with the lateral branches wide apart and with enough space between them, while the central branches are removed. In this way the plant can take heat and radiation given off by the reflection of sunlight on the wall. The best way to play an apricot tree is through a graft in the spring on a A plum, peach or almond St Julian pattern (we call “pattern” a well rooted tree with a diameter of 1 cm), using techniques known as Splinter sprung graft or graft canopy. b) Cut horizontally and down a piece of bark pattern similar in size to the previously separated so that the cambium of the pattern is exposed. Leave a small portion of lower crust without separating to serve as a subject. To link the cambium of the bud is initially cut with apricot standard cambium and tighten both surfaces using adhesive tape or raffia. When we realize that the graft has grabbed it and begins to thicken, we can remove the binding material. By the winter pattern is cut above the graft. Growth occurs from the second summer having grafted. a) Perform the same steps showed in “a” splinter graft. b) Make a cut in a “T” in the pattern to reach the cambium. Open the two vertical sides of the T without breaking it. Place the yolks produced in step “a” and close the T to the maximum covering the bud. Cover with ribbon or raffia. Remove material binding when both parties hold onto what usually happens within two weeks. Cut the pattern over the graft in winter. In well-established trees need pruning to make a spring as the buds are still closed in which the lateral branches are cut and sublaterales by 50% to stimulate new growth of young branches. By summer pruning is done flowering branches so as to eliminate a quarter of them until the outbreak. Those branches of new growth or directed downward toward the interior must be removed. It is done in cold weather the trees planted on a wall. What is done is going to guide the tree on this surface using rods on which are tied and head branches. To begin the guidance, you should leave the two side branches of the young plant located about 30 cm wide open ground at an angle of 40º. These branches are pruned leaving behind the 4th cm in length. It eliminates the central branch branch or vertical guide so that it is a plant with two lateral branches wide apart and a center well clear. From here on each of the side branches will guide a pair of pins at an angle of 40 degrees and the rest are eliminated. In subsequent summers go setting up a structure with ribs side arms always removing branches that grow downward or toward the wall. Trees as a shrub reproduced from plants should be planted at a distance of 5 to 8 meters between them and the other rows should be 8 meters away. Trees propagated in a fan should distance between them about 4 or 5 feet, leaving the same space for rows. The role of fruit thinning is to remove excess thereof that may produce fruits of sufficient quality and size. Usually what you do is first necessary to remove the fruit from each group so that they are only 3. Later re-letting entresecar between a fruit and other are about 10 cm apart. Most varieties are self-pollinators so do not need human intervention and there is no need to use different varieties or different feet. The bee is the main insect pollinator. In colder climates may be necessary to use a brush to make a manual pollination. The fruits should be collected a couple of days before full maturity. It is necessary to eat them after they are collected. The excedent can be frozen or dried. They keep fresh for a short time. The preferred substrate for this plant is the deep soil with good drainage of alkaline nature. Sandy soils does not support or too matted, because the lack of drainage causes them rot in the roots. In the wild they grow on dry hillsides, rocky and with a steep slope. They do not need a particular substrate and prefer those poorer soils to rich ones. – Earwigs: (Fortificula auriculata) leaves are eaten in summer. Can be removed using traps or a specific insecticide. – Aphids: These are insects sucking mouth equipped with gadgets that feed on the sap of plants. They deposit their droppings on them that determines that these appear sticky and, in many cases, covered with ants that are attracted to the molasses. About these secretions are developed various molds. This causes discoloration and wilting of the leaves. Among the main attacking aphids have apricot peach aphid (Myzus persicae), the waxy aphid (Hyalopterus amygdali) and almond aphid (Brachycaudus helichrysi). To combat this scourge can be washed the trees in winter with tar oil or applying insecticides such as malathion miricarb or before the leaves open. – San Jose scale or California scale: (Quadraspidiotus perniciosus) Females have no wings and are attached to the protected plant under a shell of about 2 mm. The males have wings. The nymphs are mobile at first with its three pairs of legs and laying down the plant after sinking her stilettos in the same resulting brownish crusts with a center on a larger white spot in the branches, leaves and fruits. The leaves are poisoned by their saliva and fall, the fruits show no color points and twigs or shoots rot. Prevention of pest plants involves the use of uncontaminated previously disinfected in the nursery. The treatment on the ground requires the use of oil + a suitable insecticide treatment of shock in the winter and a complementary treatment with insecticide + summer oil + copper oxiclorure 50 in summer to eliminate larvae. It has been proven the effectiveness of calcium polysulfide in summer for the treatment of this disease. It is important in the treatment of wet winter or all branches. Do not apply to wind, or rainy days with temperatures below 5 º C.
– Codling moth: (Cydia pomonella) attacks the fruit of apple, walnut, apricot and pear. The damage is caused by larvae that penetrate into the interior of it to eat the seeds, resulting in the destruction. Treatment requires the appropriate insecticide. – Big-headed worm: (Capnodis tenebrionis) is a pest that affects many fruit trees. The main damages are caused by the larvae that build galleries in weakening the plant roots which eventually die. The most appropriate treatments appear to be the use of insecticides in the field for juveniles or on the branches before fruiting in early spring. Other resources have been used as biological traps feronomas. – Goat moth: (Cossus cossus) Although primarily affects plum, can also attack other fruit trees like apricot. It is a nocturnal brown moth that can reach 8 cm in diameter with the wings open and can be seen from mid June to late August. The larvae hatch from eggs laid about 500 females under the bark. They are crimson with yellow belly and black head, equipped with large mandibles and glands that produce a very foul-smelling discharge. During the first year are in galleries excavated under the bark of the trunk at the neck. In the second year to penetrate into the wood. It is known that the tree is infected with the accumulated sawdust at the base of the tree. Primarily attack sick or old trees. It is necessary to apply an appropriate insecticide to eliminate them. – Wood Leopard Moth (Zeuzera pyrina) is a type of plague that, in addition to many large trees as oak, beech, maple, willow, linden and chestnut trees, affecting mostly apple and pear trees, but may affect other fruit trees. Moth is a male of which reaches up to 6 cm with wings open. Presents the white body with 6 points of blue, the wings are also white with small blue dots. The damage is produced by the larvae excavate galleries, which in an initial attack ends of the branches or petioles of leaves but eventually penetrate the wood and heavily damaged trees, especially old trees or in poor conditions or very young trees. In dry years the attacks are worse. The galleries open for these insects are used by other pests like beetles, red holes, etc. To prevent the spread of healthy parts of any type of drill is necessary to prune diseased parts quickly kill if they are infective larvae in small numbers by introducing insecticide within their holes with cotton soaked or using a syringe and then plugging them. It will burn the infected wood or cut the branches that have been broken by a blow or by action of the wind. Respect for the native fauna can help in controlling these pests. The birds are a good natural insecticide and ants eliminate many of the eggs. – Rust: A disease caused primarily by fungi of the genus Puccinia and Melampsora, which use the excess humidity to thrive. It manifests itself as spots of orange or brown on the underside of the leaves acquire a yellow color in the corresponding part of the beam. The treatment involves the use of an appropriate fungicide. To avoid the appearance of the disease should increase aeration of the plant and not let the tree branches that having too many damaging internal ventilation. – Moniliosis or flower blight (Monilia laxa) is a fungus that is mainly focused on the flowers that dry. Also produces a blackening of the fruits that are dried on the branches without falling. It is noted that the tree is infected by the appearance of cankers on the branches and the sticky liquid oozing out of some parts of the plant. It attacks mainly the almond tree, cherry tree, nectarines, plums but can affect many more fruits. The plague is higher in periods of high humidity. The treatment involves the use of fungicides mainly rich in copper during the winter. – Powdery mildew (Podosphaera tridactyla / Sphaerotheca pannosa) This disease is caused by fungi or Podosphaera Sphaerotheca rate. The first attacks the fruit in summer and leaves in spring. It is produced as a white spider’s web on fruits, leaves and stems. Over time these stains can become scabs. It is disease caused by infection with other plants that keep the fungus in the winter and spread their spores in spring. The Podosphaera tridactyla attacks the leaves and young shoots in summer or autumn. Especially in the young shoots can be seen slower growth, a distortion of those that are covered with a kind of white powder. It attacks mainly apples and grapes, but can also affect other fruits such as apricots, peaches and nectarines. On the skin of the fruit produces brown spots, spider web. Resist the winter on the buds or bark of trees. Many trees are contaminated by spores carried by the wind. No need to reproduce any humidity and prefer warm temperatures and little shade to very high temperatures and full sun. It is important to prevent development of disease resistant varieties to choose, plant specimens in a well ventilated area and make a proper pruning of branches to deliver them too thick. Watering the tree itself will help prevent the disease because the water may be able to clean the spores. Pest prevention also involves the use of uncontaminated seedlings in a nursery previously disinfected. Field treatment requires the use of winter oil shock treatment at this station. Vegetable oils of jojoba and melia are useful if any disease in moderate or mild conditions. quisqualis that feeds at the expense of Podosphaera. Another biological treatment is the application of the bacterium Bacillus subtilis to inhibit the growth of the fungus that causes powdery mildew. Is sold under the trademark of Serenade. Do not use sulfur on apricot trees. – Gummosis: It is a manifestation characterized by a gummy substance oozing from the bark. You can respond to various causes, from diseases to excessive pruning, failure of any component in the substrate, adverse weather conditions, injuries etc. In many cases the gumming is an adaptation of the plant itself that covers wounds to prevent invasion of external agents. To avoid such an event should be sought and addressed the causes that produce it. – Eutipiosis: (Eutypa armeniacae / Eutypa lata): The most common symptoms of this disease also attacks the vine are often sudden fractures of branches in old trees and the sudden wilting of leaves. It is a cause that produces more gummy in the wounds healed pruning. Around the same is in general a lot of resin oozing chancre. Later the fungus advances towards the center of the plant and ends up killing her. To prevent the disease is to use pruning tools previously disinfected. Try to do the pruning dry days to prevent the growth of these fungi and seek to reduce pruning old trees. The solution is to use a fungicide paint that covered the injuries on the tree after pruning. 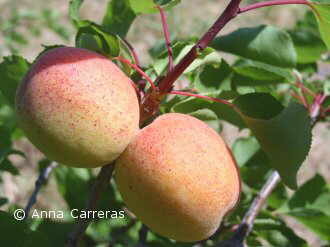 – Peach blight (Fusicoccum amygdali) mainly affects the almond and peach trees but may appear in the plum and apricot. It is a disease caused by the fungus Fusicoccum amygdali that causes brown and elongated cankers at the base of the knots and yolks branches of the year, leading to the strangling of them and its death by preventing the passage of the sap and by the action of the toxins of the fungus. It also attacks the leaves large brown spots. Infection occurs through spores spread by rain penetrating wounds more or less large each of the parts of the plant or directly through the young buds. The treatment involves removing the affected part of the plant and the use of fungicides.